Calvin C. Rhodes is the Chief Information Officer for the state of Georgia and Executive Director of the Georgia Technology Authority. Mr. Rhodes came to state government in January 2011 from Paladin Investments, a private investment company he established and has served as managing partner since 2009. Prior to starting his own firm, he worked for Fulton Paper Company for 27 years, serving most recently as executive vice president. 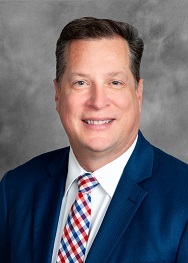 Previously, Mr. Rhodes held various positions within the company, including vice president of operations and chief information officer/vice president for information technology. He began his career with the company in its procurement area. Governor Nathan Deal named Mr. Rhodes to lead the state’s public/private partnership IT transformation and consolidation effort. The initiative has strengthened security, modernized infrastructure and networks, improved reliability and increased transparency in the state’s IT enterprise. Building on its successes, the state is now evolving its service delivery model to enable state agencies to more easily benefit from changes in the IT marketplace. Mr. Rhodes and his team promote an enterprise approach to technology by establishing statewide policies, standards and guidelines based on industry best practices and federal requirements. The state of Georgia’s leadership position in using technology to improve service delivery has been affirmed by the Center for Digital Government, which awarded the state a letter grade of A, the highest ranking possible, in the 2018 Digital States Survey. In addition, Georgia placed first in the nation in the category of Adaptive Leadership and was named among the top five states in the category of Collaboration. Georgia received an A- in both its 2014 and 2016 surveys. As state CIO, Mr. Rhodes chairs Georgia’s Statewide Cybersecurity Board, created in 2015 by executive order, to assess and strengthen the state’s security posture. He led GTA’s oversight of the construction of the Georgia Cyber Center in Augusta. The first of the center’s two adjacent buildings opened in July 2018, and the second building opened in January 2019. Mr. Rhodes has also been responsible for partner coordination at the center, which promotes modernization in cybersecurity technology and workforce development for the public sector and private industry through unique education, training, research and practical applications. Mr. Rhodes is an active member, past officer and executive committee member of the National Association of State Chief Information Officers. He is a member of the Georgia CIO Leadership Association and received the association’s 2018 CIO of the Year ORBIE Award for the nonprofit/public sector. Mr. Rhodes serves on the Technology Association of Georgia’s Science and Technology Executive Committee and was honored for his leadership by the association in October 2015. In addition, Computerworld magazine named Mr. Rhodes a 2016 Premier 100 Technology Leader in recognition of his technology leadership and innovative approaches to business challenges. Mr. Rhodes was selected by Government Technology as one of the nation’s Top 25 Doers, Dreamers and Drivers for 2016 for his accomplishments using technology to improve government operations and help the public sector serve citizens more effectively. Mr. Rhodes is a graduate of Darton State College and Georgia Southwestern University and holds a degree in computer information systems. He also earned a master of business administration from the University of Phoenix.